For my friend’s son who loves trains, I started a project. They’ve recently moved and he has this new big boy room, and I went with the color scheme they’ve used already. Started with orange and white striped 8.5″x11″ paper and trimmed down to 8″x10″ so it would fit in a frame I already had. I used my paper cutter for this. Made some word art letters to print. I printed on regular paper because I don’t know if our printer would do well with construction paper. Instead of a solid line, I outlined the letters in dots so it would be less visible if I messed up the cut job. I glued the white letters UPSIDE DOWN to the yellow construction paper. Didn’t use a ton of glue in case I wanted to peel the white piece off. 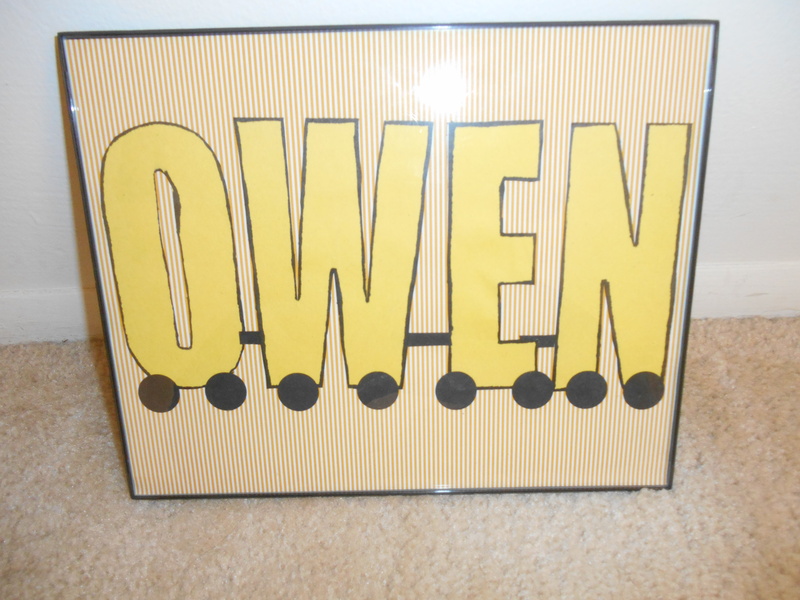 Then I cut around the letters and flipped them over so the yellow side was RIGHT SIDE UP. As I held the letters up to the background, it wasn’t a very good contrast. I took a black Sharpie and outlined the letters. This was the MOST stressful part of the entire process, and I did mess up on the middle of the O! Glued down the yellow letters on the striped background. Used a 3/4″ circle punch (from Michaels) to punch out 8 “wheels” on black construction paper, and glued them down (two wheels for each letter). Cut a thin strip of black paper into pieces for the joining pieces between the letters. Popped it in a frame- voila! Not perfect but I am certainly proud and excited for him to have it!